MOORESVILLE, NC (May 25, 2016) - Toy State, a toy industry leader and innovator, has once again pledged its support to helping children with mobility issues. Today, along with Tommy Baldwin Racing, Toy State hosted their 4th Go Baby Go workshop over the last 12 months and the second in Charlotte. Today's workshop took place in Mooresville, NC at the Tommy Baldwin Racing shop. 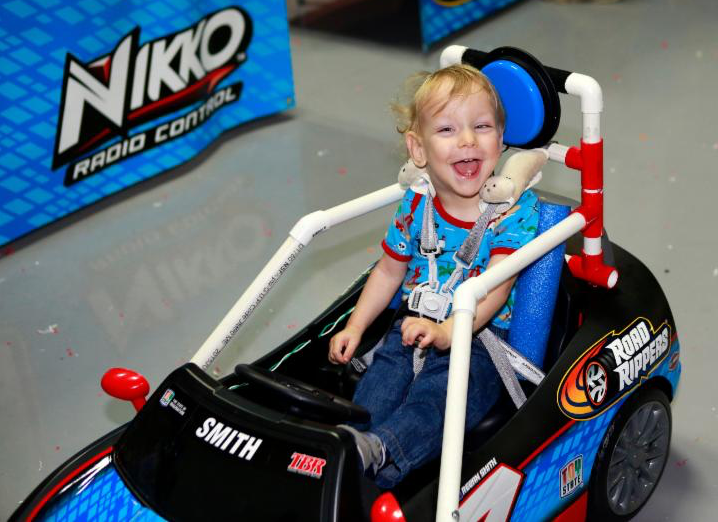 Toy State provided ten area children with a ride-on car that was outfitted to model the No.7 Nikko RC / Toy State car driven by Regan Smith on the NASCAR Sprint Cup circuit. Smith along with fellow NASCAR drivers Kasey Kahne, Michael McDowell and Ryan Preece were in attendance along with other members of the NASCAR community. Toy State is currently in the middle of a 14-race partnership with TBR as the primary sponsor of the No. 7 car. Go Baby Go is a national, research-based program that provides modified, ride-on toy cars to young children with disabilities. The cars give children with Spina Bifida, Cerebral Palsy, Down Syndrome and other mobility disabilities a chance to play and socialize with their peers more easily. The program was launched by founder Cole Galloway at the University of Delaware in 2012 and expanded to Oregon State University under the direction of Sam Logan in 2014. "We are so proud that today marks our fourth Go Baby Go workshop and second in Charlotte," said Andy Friess, Toy State President. "Today's event was another huge success. 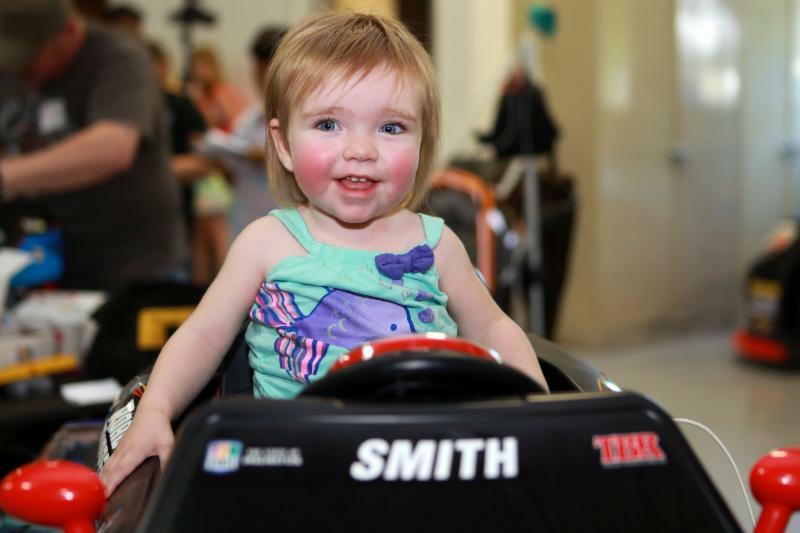 For the second year in a row we were able to provide ten Charlotte area children with specialized ride-on cars that look just like our number 7 car, plus a chance for these kids to spend time with NASCAR drivers. Over the last 12 months we have provided more than 40 children with their own Nikko RC/Toy State car. Giving back is so important to Toy State and we are thrilled to do our part." For more information about how you can get involved in Go Baby Go visit the University of Delaware's GoBabyGo website, http://www.udel.edu/gobabygo/. The site includes contact information for program affiliates across the United States and around the world, as well as information about how to bring a car-modifying workshop to your area. For 30 years, Toy State has been an innovator and industry leader in the manufacture of 'lights & sound' and R/C toy vehicles. Founded in 1984, Toy State's portfolio features their flagship Road Rippers® and Nikko™ brands. The company also boasts Hot Wheels™, WWE® and James Bond 007™ lights & sound and radio controlled vehicles, as well as Cat® and Cat® Preschool construction toys. Working with the world's leading automakers, and Caterpillar, the leading manufacturer of construction equipment, Toy State products provide hours of enjoyment for kids of all ages. For more information, visit www.toystate.com.